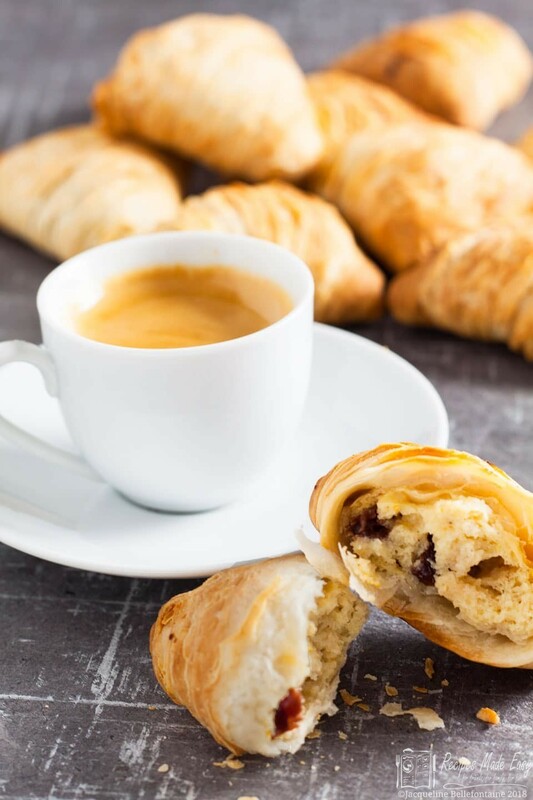 Sfogliatella Riccia are delicious flaky pastries from the south of Italy. 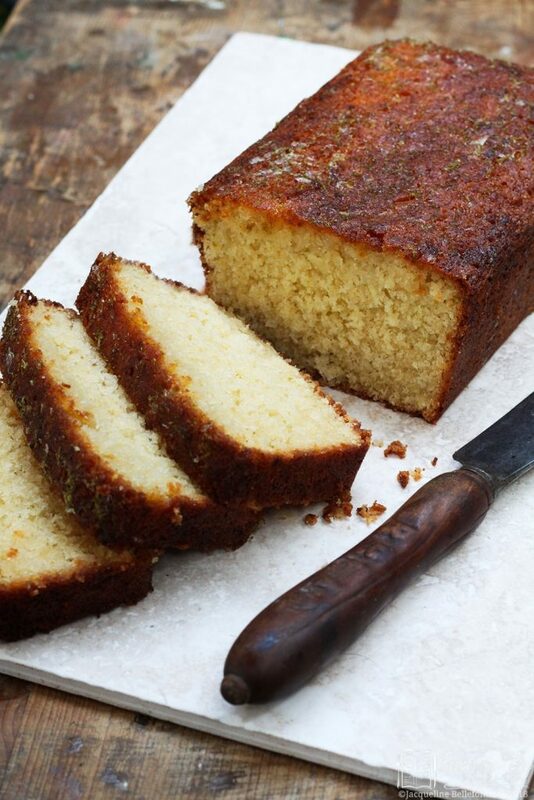 Filled with a ricotta mixture, and usually flavoured with citrus peel. Sfogliatella means ” thin leaf”, describing the pastry’s texture which resembles stacked leaves. 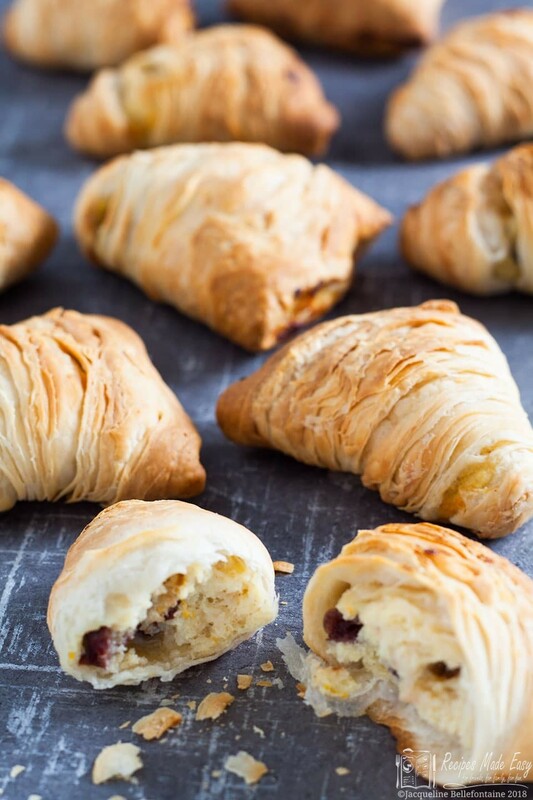 These Sfogliatella Riccia pastries are filled with a cranberry and orange filling. When I found out that The Great British Bake Off was doing an Italian themed week I was really excited – I love Italian food. The contestants were asked to make pizza and Cannoli (small tubes of sweet pasta-like dough filled with a sweet filling) both of which I have made before. However, this week the show stopper challenge was to make Sfogliatella Riccia. I don’t remember having even tried them before, so I decided that these had to be my choice for this week’s Bake Off inspired post. 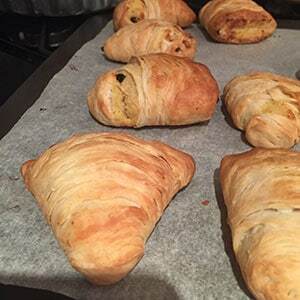 I set about googling the pastries for a recipe and in the end chose this one as a base since it seemed fairly authentic. The quantities were quite large, so I halved them. Some of the recipes I found included butter in the dough itself so I decided to add a little, rubbing it into the flour before adding the water. To get the wafer thin layers you need to roll the dough very thinly and then roll it up tight like a swiss roll. While it is possible to roll it by hand it takes a very, very, long time. Luckily I have a pasta roller attachment for my Kenwood, which takes out a lot of the hard work. I’m not sure I would want to make them without the help of a pasta roller. To keep the pastry layers separate, the pastry is smeared with butter or lard before rolling. I chose to use butter but on reflection I think lard may be more authentic and would probably give a crisper result, so I will leave that choice to you. After resting them they are cut into slices and then pressed out between your fingers and thumb to form a cone and filled with the ricotta filling. 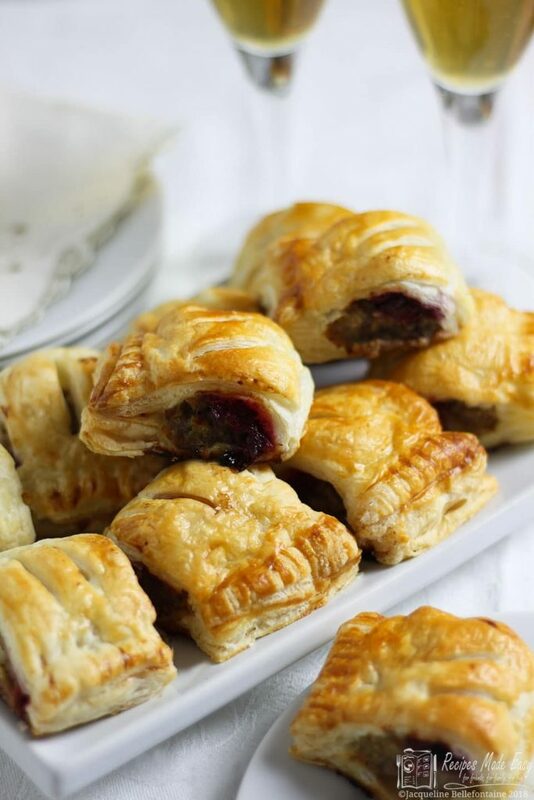 I am not a huge fan of candied peel so decided to use dried cranberries in the filling instead along with a little cinnamon and orange zest for extra flavour. This is the hardest part, as shaping the cones is a bit bit tricky but gets easier after a few goes. The trick is to work quickly so that the pastry does not warm up too much. Finally they are baked until crisp and golden. I really enjoyed making these, and it was fun to try something new. It is time consuming though, so allow at least an hour for all that rolling. Plus severeal hours for the dough to relax and chill. Shaping the cones was the hardest part but even being a little heavy handed and not quite knowing for certain if I was doing it right, I found the pastries still ended up crisp and delicious. I would certainly make them again. They are worth the effort, and I am sure next time around I would be quicker and the results would be even better. A case for practice makes perfect I think!. 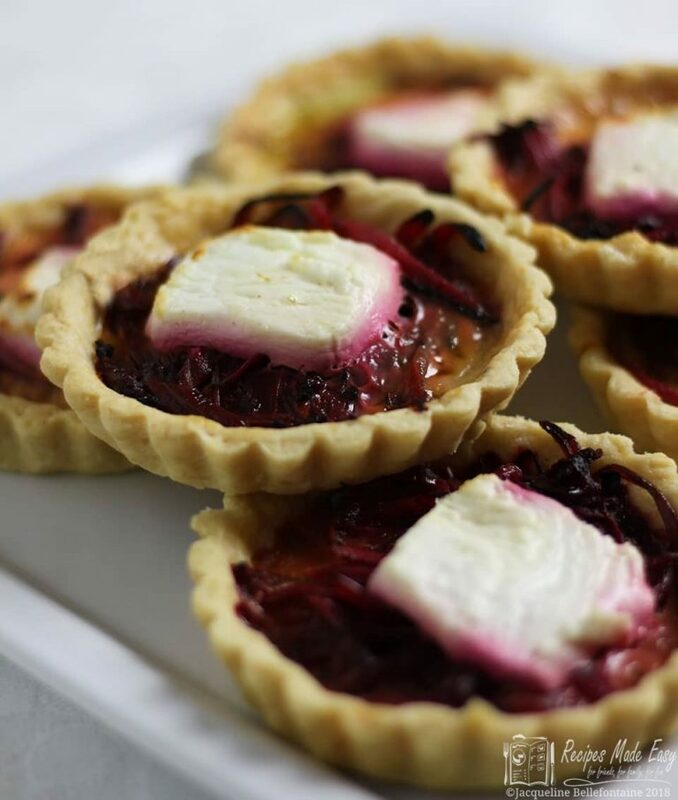 A classic Italian pastry consisting of layers of wafer thin pastry formed into shells and filled with a cranberry, cinnamon, and orange flavoured ricotta mixture. Allow plenty of time for chilling and resting. Place the flour in a mixing bowl and rub in the butter. Add the salt, water and honey. Mix until the dough starts to come together. Tip out onto a work surface (the dough will be quite crumbly at this point) and knead well for at least 10 minutes to form a firm, stiff dough. Cover and leave to rest for at least 2 hours. Melt the butter or lard. Cut the dough into 8 equal pieces. 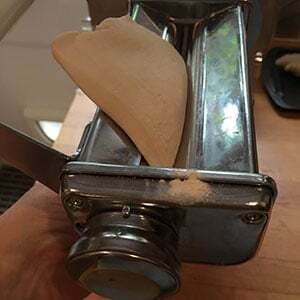 Starting with the widest gap, pass one piece of dough through the pasta roller several times fold in half after each time. Once you have passed it through a few times you should have a piece of dough that is almost as wide as the rollers. Now you can start rolling it thinner. Each time reducing the gap between the rollers until you have a long very thin length of dough . Brush the dough generously with melted butter and start to roll up as tightly as possible like a Swiss roll, stretching the dough wider as you roll it up. Roll a second piece of the dough as before. Starting with a wide gap and then decreasing the gap until the pastry is very thin. Brush with melted butter then place the rolled up pastry at one end and continue to roll the pastry around the log . Repeat with two more pieces of pastry, then wrap the pastry log up with cling film and chill for at least 2 hours or overnight. Do the same with the remaining four pieces of dough so that you have two logs chilling. Place the semolina, sugar, milk and cinnamon in a small saucepan and heat gently stirring until the mixture thickens. In a bowl, beat the eggs and ricotta together then beat in the chopped cranberries and orange zest. Then gradually beat in the semolina mixture. Take one log out of the refrigerator, trim the thinner ends then cut the log into 12 slices. 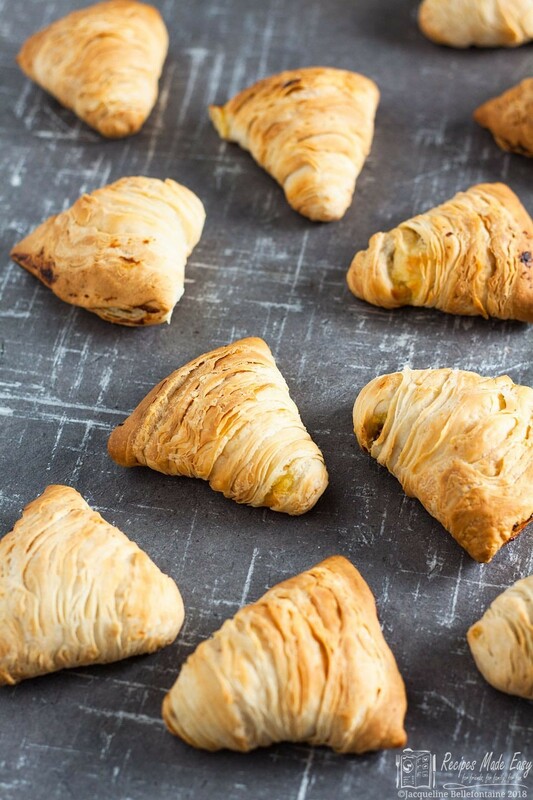 Push the centre of the slice with your thumb and at the same time use your fingers to pull the pastry into a cone shape. Place a spoonful of the ricotta mixture into the cone. Then punch the edges of the pastry together to close. Place on a baking sheet. Repeat until you have filled and shaped 24 shells. Preheat the oven to 200℃ (190℃ fan)/400°F/gas mark 6. 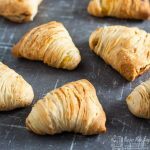 Bake the sfogliatella for 20 minutes or until crisp and golden. Allow to cool before serving. Dust lightly with icing sugar if desired. Pass the dough through the widest gap on the rollers a few times. Continue rolling reducing the gap each time. 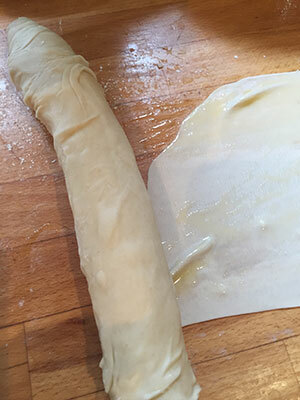 Brush the now very thin pastry with the fat. Stretch the dough wider as you roll. Repeat the rolling and continue to build up the roll with additional sheets of pastry. Repeat until you have used four pieces of dough then start again and make a second roll of pastry. Cover and chill for several hours. Beat the ricotta and eggs together. Beat in the cranberries and orange zest. Then beat in the semolina mixture until combined. After chilling the dough for several hours, trim and cut each log into 12 slices. bush the centre of each slice out and pull up edges to form a cone. Once the dough resembles a cone. Place on a baking tray lined with parchment. They look amazing! Well done you for giving them a go! Thanks Stacey. Its always fun to try new things in the kitchen and this was no exception. It was fun to try something new. I would make them again as I thought they were great not too sweet. Wish I had dusted mine with icing sugar I think they look prettier that way. Jacqueline these are truly amazing! Well done for giving them a go. I thought they were far too much effort after watching the show , I don’t think my clumsy fingers would make them successfully at all! you would have done so well on the show had you ben a contestant, mind you I guess it was not as hot in your kitchen as it was inside the tent that day. I did feel for them all. I made mine before watching the show maybe i would have opted for something else if I had. seriously though it was fun to try something different. You’re amazing Jacqueline! They look stunning. I can already taste them. I need to try your recipe. Thanks Rebecca. Disaster in the kitchen help us learn so not the end of the world. I much prefer cranberries to candied peel unless its the really good stuff.